Culture which was born and developed in the Mediterranean was widely distributed to the east by Alexander the Great and across the Atlantic by Christopher Columbus. Often times Columbus – who learned the art of sailing in the Aegean – would say: “Alexander turned the Easterns into Greeks, I will turn them into Christians…” Hatziandoniou jewels – participating in the celebration of the 500 years anniversary of the discovery of America by the Europeans (1492 - 1992), in the “Third Mediterranean Engraving Bienale” entitled “Alexander the Great and Christopher Columbus” which took place on Kos and was organized by the Honorary Italian Embassy on the island as well as in the campaign for the promotion of National issues such as the Greekness of Macedonia for 4.000 years, - propose a set of two pieces of jewels made of copper, silver and gold on A “Santa Maria” the legendary galleon of Columbus and B the two great men: marshal Alexander the Great and navigator Christopher Columbus. 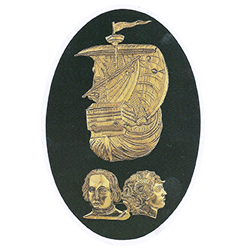 The set of these two jewels is called “Alexander the Great and Christopher Columbus” and was awarded by a ten member committee consisting of Professors of the School of Fine Arts in Rome, Journalists and Art Critics with the First prize of the County Administration of Rome. The art critic Anny Baltiserra commented on the Italian television that the jewels were “original and well made”. Since 1980 the jewels Chatziandoniou undergoing its third decade in the field of Greek jewelry. Over time we evolved keep up with the international trends of jewelry. Designing and making jewelry in our laboratory to meet the major trends of contemporary jewelry. Bidder at very affordable compared to their quality, prices giving value for your money. In our shop NIKOS GOLD, Kanari 33 we give you the freedom to express yourself, since you can trust us your dreams "with hand on heart" and not in your pocket.